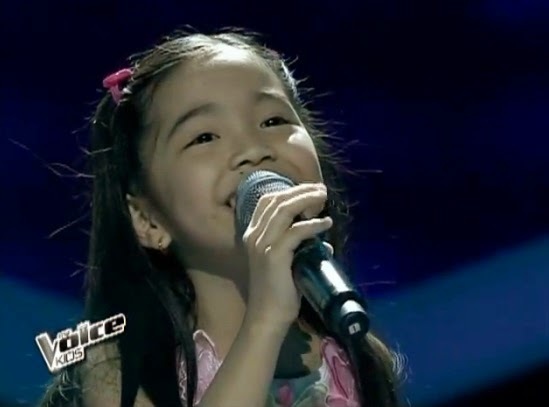 Manila, Philippines - Team Lea's young artist Darlene Vibares sang "Louder" on the grand finals Upbeat Song Round of ABS-CBN's top-rating and Twitter-trending singing competition 'The Voice Kids' Philippines on Saturday, July 26, 2014 at the Resorts World Manila, Newport City, Pasay City. The 10-year old kid from Antipolo City is among the Final 4 artists of the competition under Coach Lea. "Lahat ng ginawa mo perfect. Wala na ako mahihiling pa.", Coach Lea said to Darlene. There are 3 rounds in the grand finale: Power Ballad, Upbeat Song and Special Performance with Celebrity Guest. Aside from Darlene, other artists aiming for the title are Team Bamboo’s Juan Karlos Labajo and Team Sarah’s Lyca Gairanod and Darren Espanto. The grand winner of 'The Voice Kids' will be determined based from the combined results of text and online votes. Text VOICE DARLENE and send to 2331 for ABS-CBN Mobile, Globe, TM and Sun Cellular subscribers and 231 for Smart and Talk 'N Text subscribers. The tariff is P1.00/vote for ABS-CBN Mobile, P2.50/vote for Globe, TM, Smart and Talk 'N text and P2.00/vote for Sun Cellular subscribers. Note: One vote per artist per SIM per round only. To vote online, go to http://thevoice.abs-cbn.com/vote. Log-in using valid email account. Enter PIN code of your ABS-CBN vote card and select name of artist (Darlene). Tariff is P5 per vote. Note: 5 votes per artist per email account per day only. The finale episode on Saturday tops online conversations with '#TheVoiceKidsFinale', 'Total Performer', 'Go Juan Karlos', 'Narito Ako', 'Hi Sarah' and 'Standing Ovation' among the trending topics. Don’t miss “The Voice Kids” Philippines final results announcement on Sunday (July 27), 6:15 PM on ABS-CBN.